Sangamon State University, Springfield, Ill. THE BOARD members of Commonwealth Edison Co., the nation's largest producer of nuclear power, were gathered in late May at the company's headquarters on the thirty-seventh floor of the First National Bank building in Chicago to contemplate what could be a fateful decision for the utility and for the future of nuclear power in Illinois. In three earlier board meetings, department heads and members of company panels with names such as the "load and capacity committee" had been summoned to present growth and cost projections regarding Commonwealth Edison's construction schedule, which calls for eight additonal nuclear reactors. The utility presently operates seven reactors at three power stations in northern Illinois, more reactors than are situated in any other state. The outlook for the nuclear business appeared bleak. Company analysts and computers had reached the prediction that consumption of electric power would grow over the next 10 years only about 4 percent annually, half of the load growth anticipated 10 years ago when expansion was charted. Compared with 1979, the utility in 1980 had sold 700,000 fewer kilowatts to its large industrial users, primarily due to the recession. The cost of obtaining construction financing from bond house syndicates had doubled. The company's bond rating over the past two years had plunged from double-A-minus to single A. Projected 1980 earnings were down from $3 to $2.51 per share. And perhaps the most foreboding report to board members: construction costs of a nuclear plant had exploded far beyond projections, at a pace more rapid than the rate of inflation. In 1960, the company completed its Dresden No. 1 reactor near Morris, the first privately built commercial nuclear reactor in the world, at a cost of $36.1 million. Ten years later, the combined cost to build another Dresden No. 1 and No. 2 was $232 million. 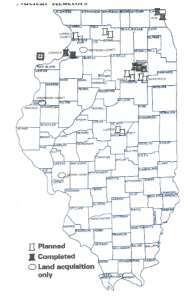 In 1981-82 when the LaSalle County Station comes on line, the cost is expected to reach $1.9 billion. In a decade, the same plant will cost about $4.5 billion, according to the utility's projections. After an hour-long presentation by Commonwealth Edison's chief executive officer, James O'Connor, who used graphic charts to reiterate the difficult financial conditon of the company, the 13 board members reached a unanimous decision. They voted to delay for up to two years the construction and start-up of three twin-reactor power plants at LaSalle, Byron and Braidwood. And with some cringing, they approved a revised construction budget of $5.5 billion, which is $1 billion higher than the previous program. The decision was made, in the words of one company official, "with some degree of intelligence and prudence, so that by stretching out the schedules we aren't putting money in the ground too soon." Three months earlier, a similar meeting was convened in Chicago by board members of Illinois Power Co. of Decatur, the only other Illinois utility in the nuclear business. Although a neophyte in the nuclear industry, with its first reactor in Clinton not yet on line, Illinois Power began a course of retreat similar to that of its seasoned competitor to the north. The company postponed plans to build a second nuclear reactor in Clinton. Some nuclear industry officials close to the decision doubt that the second reactor will ever be built. At the same time, the company was forced to increase to $1.4 billion the projected cost of the Clinton No. 1 reactor, marking at least the sixth upward cost revision since it was estimated five years ago that the reactor could be completed for $429 million. construction of the first unit, ranging from cost overruns to bad weather to bad performance ratings from state analysts during Illinois Commerce Commission rate hike hearings. The problems were illustrated in a manner highly critical of the utility during a segment of CBS Sixty Minutes in November of last year. The company countered with its own 42-minute film alleging inaccuracies and bias in the network televison account. 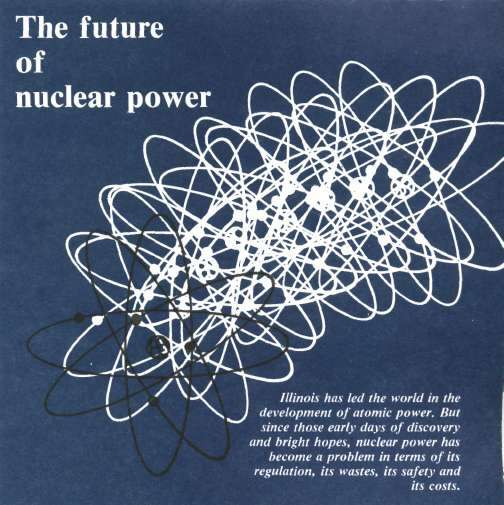 The decline of the nuclear industry is by no means restricted to Illinois. Indeed, the nuclear business in Illinois appears in some respects healthier than the industry nationwide. 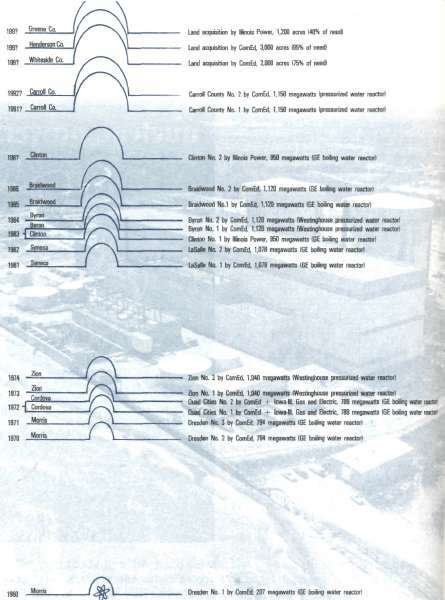 The last order nationally for a nuclear reactor was placed by Commonwealth Edison in December 1978 for its Carroll County, Illinois, station, although construction plans there may be delayed. Utility cancellations of reactor orders are a dramatic measure of the slowdown in the nuclear industry. So far in 1980, eight orders for reactors have been cancelled — four from Ohio utilities alone. In 1978-79, a total of 19 orders were cancelled nationwide, but none from Illinois. In terms of expansion of nuclear capacity, Illinois ranks second only to Tennessee, where nine reactors are planned, according to the Atomic Industrial Forum. The Three Mile Island nuclear accident near Harrisburg, Pa., shook public perception of nuclear power, while resulting in new safeguards required by the Nuclear Regulatory Commission. But it apparently contributed less to the industry slowdown than is commonly believed, and substantially less than the simple effects of supply and demand. In the late 1960's and early 1970's, when many utilities drew expansion plans of grandiose proportions, the average estimated load growth rate around the country was 7 percent annually. However, the 1973 oil embargo by Arab nations set in motion a chain of events that would markedly alter patterns of energy consumption. In the words of Scott Peters of the Atomic Industrial Forum, "Utilities suddenly found that they were overcommitted, and their load growth projections had to be tossed in the wastebasket." After electric power use grew by 7.9 percent m 1973, it plunged to a negative 0.1 percent the following year. In 1975 it grew at an average of only 2 percent, followed by increases of 6.2, 4.2 and 3.8 percent in 1976-78. Now, the average 10-year growth projections nationally are between 3 and 4 percent. The relative health of the Illinois industry is rooted in its status as the first and most heavily committed state in atomic power development. In December 1942, when the Manhattan Project at the University of Chicago achieved sustained atomic chain reaction leading to the atomic bomb, Illinois established a lead in nuclear energy which has never been relinquished. Control of the atom would flourish in the state where the world-altering phenomenon was first demonstrated. During the U.S. Atomic Energy Commission's program to study the use of atoms for electricity and medical purposes, the Argonne National Laboratory at Lemont carried out a significant portion of the research. From 1951-55, Commonwealth Edison contributed about 15 members to the Nuclear Power Group, an alliance of 25 engineers and scientists who studied the commercial feasibility of nuclear power under the military designation of "Q" clearance. In 1955, only a year after Congress passed legislation enabling private industry to operate nuclear power stations, Commonwealth Edison began construction of its nuclear reactor at Dresden. When that facility came online five years later, it was labeled by Atomic Energy Commission chairman John A. McCone "the most advanced nuclear power station in the world and a blueprint for the future." Pioneer status, combined with the deep investments by the Illinois nuclear industry, lend stability at a time when the nuclear cutbacks are more sharply felt in most other states. And as nuclear power plants have multiplied in Illinois, industries associated with nuclear energy have sprouted. At the southern tip of the state in Metropolis, a tiny community whose chief distinction is sharing the name of the make-believe city in Superman comic lore, Allied Chemical Co. in 1961 established a uranium hexaflouride plant. Using the newest technology, the commercial plant converted concentrated uranium to uranium hexafluoride. (Uranium hexaflouride has a low melting point so it is easily converted to a gas for gaseous diffusion which is important for fuel enrichment.) Across the Ohio River in Paducah, Ky., another plant crucial in the production of nuclear fuel is operated by Union Carbide Corp. Here, uranium is isotopically enriched when hot uranium gas cascades through miles of steel barrels with nickel filters. In 1972, the Fermi National Accelerator Laboratory opened in Batavia 20 miles west of Chicago. Named after the Manhattan Project leader, Italian exile Dr. Enrico Fermi, the Fermilab is operated by Universities Research, Inc., a Washington-based consortium of research institutions. Using state-of-the-art instruments of nuclear research, the 1,700 full-time employees at the lab study particles of the atom. In research procedures, protons, which result from stripping hydrogen atoms of their electrons, are propelled through an accelerator, receiving a 3-million-volt charge of energy during each of 50,000 revolutions per second through the accelerator. After the extreme energy boosts, protons are removed from the accelerator for lab experiments. It is one of two primary atom research facilities in the world; the other is in Geneva, Switzerland. The laboratory, which has no product other than information, is currently planning a new $100 million development project which would use an advanced electromagnet in its studies. The Fermilab, like other nuclear interests, has recently encountered funding problems. At Argonne, about 40 percent of the present laboratory research is nuclear related, with a primary emphasis on developing breeder reactors. Breeders, which create more fuel than they consume, are currently forbidden in the United States, largely because of government fears that the quantities of fuel generated could lead to the proliferation of nuclear weapons. Argonne operates a liquid-metal cooled breeder reactor for experiments, the only one of its kind in the United States. Under an agreement with the United Kingdom, Argonne scientists and their counterparts at a fast breeder reactor in Scotland conduct joint tests aimed at establishing safeguards in the controversial breeder technology. The multi-billion dollar nuclear industry has generally enjoyed a favorable political climate in Illinois. "If you pull the plug on nuclear, you pull the plug on life," Gov. James R. Thompson has said, summing up the protective attitude toward nuclear power under which his administration has operated since 1977. Until recently, the major state government group concerned with nuclear power has been the Atomic Energy Commission, which consists of members who have generally adopted positions in support of the industry. State government structure with regard to nuclear issues has often been the target of complaints from environmental groups. "So far, the people who have been involved in nuclear discussions for the state, like the avidly pro-nuclear Atomic Energy Commission, have taken vocal positions on behalf of the nuclear industry, and have attempted to minimize the problems associated with nuclear power," said Catherine Quigg, research director of the Palatine-based Pollution and Environmental Problems. Unlike many companies, utilities are unable to improve their government relationships with political contributions. Nonetheless, their power to control the flow of legislation is sometimes viewed as awesome. The clout is evident in their ability in the past two legislative sessions to repeatedly bottle up in committee nuclear moratorium bills and other regulatory measures. Nuclear interests appear successful in overcoming the lack of wheel-greasing benefits from political contributions with a combination of skillful lobbying and timely contacts by top company executives. field" after losing to them in a legislative dispute over nuclear waste. Charles A. Willsey, the General Electric public affairs director for Illinois and a lobbyist for his company in Illinois and several other midwestern states, said he believes that the industry lobbyists have been forced to increase their efforts in the wake of Three Mile Island. "We have to talk to an awful lot of people. Before, we would concentrate on committee chairmen and key legislators. We realize that we have to be straight with legislators, and not just in a technical way." The Three Mile Island accident and the resulting heightened public consciousness toward nuclear issues prompted initiatives by the governor and a flurry of bills in the legislature — some of them anti-nuclear in tone. By order of the governor, a new Department of Nuclear Safety began October 1, the first such cabinet-level department on nuclear issues. The agency assumes a broad range of monitoring and other duties relating to nuclear power, which had been vested in several state agencies, mainly the Department of Public Health and the Environmental Protection Agency. The state's overall nuclear policy will be set by the new department, and early indications are that its first major task could be supervising development of a unique, state-operated waste disposal site for low-level nuclear waste. Said Thompson of his new code department, "What I'm trying to do is assure the public, to the extent that government can do it, of protection for them against nuclear accidents and violations of safety rules or danger of exposure through nuclear medicine." Although labeled "cosmetic and windowdressing" by nuclear foes, the new department is endorsed by the nuclear industry. "We are against any growth in bureacracy that provides a check on us, but we feel that if the public is more assured of nuclear power safety, it is ultimately good for the nuclear industry," said Willsey of General Electric. The industry, and particularly General Electric, was less enthused about 1979 legislation introduced under the governor's direction which assesses utility fees to establish a monitoring system for nuclear plants. The $4.2 million raised from the three-year program will also help Illinois finance costs of a federally mandated plan (due in April of next year) for radiological accidents. The legislation required a one-time fee of $350,000 for each nuclear plant, in addition to a $75,000 annual fee for each reactor. The costs of the three-year program are passed on to ratepayers. In the post-Three Mile Island state legislature, General Electric may be suffering more than the utilities. The company, although operating no nuclear plants in Illinois, is the world's second largest builder of nuclear reactors, behind Westinghouse Corp. GE did not escape monitoring system fees of $25,000 yearly and $1,000 per shipment of spent fuel rods received at its Morris Operation. Additionally, General Electric was the target this year of the most stringent nuclear regulatory bill ever passed in the General Assembly. The bill, sent to the governor in June, would ban the storage of spent fuel from other states in Illinois. It includes a reciprocity provision — designed to counter arguments that such a ban would unconstitutionally restrain interstate trade — stating that Illinois can accept spent nuclear fuel from states that accept the materials from Illinois. However, that provision is viewed as meaningless because Illinois' nuclear reactors are equipped with on-site storage capacity for spent fuel. If the governor vetoes the bill, there will surely be an override attempt. The General Assembly can be expected to flail at the nuclear industry, despite constitutional constraints. But nuclear interests have the most to fear from government agencies which are nonpolitical by design. The Illinois Commerce Commission (UCC) poses a threat to nuclear expansion each time it rules in a utility rate hike case. UCC decisions on requests for controversial construction-work-in-progress costs (CWIP) have become crucial in nuclear plant planning. CWIP enables utilities in effect to bill ratepayers now for construction costs of power plants that will not be operating for years. Proponents contend that it is cheaper for customers in the long run, while enabling the utilities to better meet inflationary construction costs and maintain borrowing power. The issue has been the subject of heated disputes in UCC rate hike hearings. One CWIP opponent, Ronald L. Knecht, a staff member for the California Public Utilities Commission, testified at a hearing, "The best signal that regulatory commissions can send to investor-owned utilities to promote prudence in planning is that the utility and stockholders will not be subsidized by ratepayers or bailed out of tight situations." IlCC commissioners have generally ignored such contentions. Late last year, the commission awarded Illinois Power $97 million in CWIP costs, and several months later, Commonwealth Edison was allowed to add $343 million of the company's construction costs to utility bills. Control of nuclear power at the state level is minimal compared to the Federal Nuclear Regulatory Commission's life-and-death grip over nuclear plants from blueprint to decontamination. Since Three Mile Island, the commission has ordered extensive changes in safety systems, increased training of plant employees and upgraded emergency planning. The NRC has at times not hesitated to use the power of fines in Illinois to more forcefully achieve compliance with federal regulations. Commonwealth Edison has been fined about $110,000 for a variety of violations regarding plant security, operator errors and sloppy handling of nuclear materials. The nuclear "event" in Illinois that became celebrated was a stuck water level indicator at Dresden in 1970, an occurrence on which technical engineers based a portion of the Ventana power plant incident in the 1979 movie The China Syndrome. But the movie was of less concern to industry officials than the nonfiction jolt they received this year. Commonwealth Edison and two of its officials were indicted in March by a federal grand jury on nine counts of conspiracy and fraud. The indictment arose from allegations by former employees of security breaches and doctored records regarding unlocked doors and unescorted visitors at the company's Cordova station. Never before was a utility indicted on criminal charges involving nuclear plant operation. After all its distinctions in nearly 40 years — the oldest, the largest and the most advanced — Illinois' nuclear industry had achieved yet another first. After a widely publicized trial in Rock Island, Commonwealth Edison and its employees were acquitted in August. The trial was termed "an ordeal" by one company official. A federal prosecutor said it "would serve as a lesson" to the nuclear industry. That lesson, presumably, is that utilities can expect to appear in other courtrooms. But they will also continue to testify in the hearing rooms of the General Assembly and of Congress to impress upon the legislators their pro-nuclear views. The utilities can also be expected to appear in the meeting rooms of the Illinois Commerce Commission to press for rate hikes to bolster their nuclear investments. The ultimate decision on nuclear power may be made in their board rooms on the basis of profit margins. William Lambrecht is the Springfield correspondent for the St. Louis Post-Dispatch. He focuses mainly on political and environmental subjects, and he wrote for Illinois Issues' first magazine in January 1975. What to do with the heaps and bundles of radioactive wastes? THE CRADLE of nuclear power is beginning to rock with the waste of its no longer infant industry. Illinois, after nearly four decades in the vanguard of the atomic age, faces difficult decisions in what to do with the heaps and bundles of lethal radioactive wastes swelling within its borders. The solutions have been elusive, and at times seemingly unattainable, in large measure because waste from nuclear energy is a predicament of national proportions. The separate states have neither the technology nor the tenacity to provide a burial ground for materials that may remain radioactive for a million years. And the problem has been treated by the federal government much the way nuclear waste is handled — put aside to be dealt with another year. month period for violations of regulations regarding packaging and shipping of materials to a site at Barnwell, S.C. Officials there said that it was the worst record of any utility. The governor's threat of a shutdown in nuclear facilities may have been overstated, particularly in the case of power plants which have the ability to enlarge on-site storage capacity. But his reference to a potential crisis underscored the growing realization by government that atomic waste must be dealt with in an organized fashion, and as rapidly as possible. An astronomical difference exists between the high-level waste of used nuclear fuel and the low-level waste from nuclear plant residues, such as contaminated clothing, or materials from medical diagnostic procedures and cancer treatment. Extreme amounts of wastes at both ends of the spectrum must be dealt with in Illinois. Just one basket of used fuel rods stored in containment pools of the General Electric Co. nuclear fuel repository near Morris contains about 800,000 curies of radioactivity — far more than all the low-level waste stored in one year around the country. About 325 metric tons of high-level material is stored at Morris, in addition to the tons of spent fuel stored on-site at Illinois' seven nuclear reactors. Of primary concern to state officials is how to best secure disposal of about 7,000 cubic meters of low-level waste generated annually in Illinois, which ranks third in the nation behind California and New York. In Illinois, about 60 percent of the waste comes from nuclear reactors, but it will increase in the next few years when four new reactors come on-line. Unlike the high-level wastes, there are indications that the less radioactive materials should be dealt with by states. And the state of Illinois may be preparing to take the lead in establishing a state-operated facility for the low-level wastes from Illinois, and possibly other mid western states. every state," the governors said in their resolution, "it is unfair to expect three states to shoulder the sole responsibility for the safe disposal of the entire nation's waste." Their reference was to the three active disposal sites at Barnwell, S.C., Beatty, Nev., and Hanford, Wash.
Thompson said at the meeting, "It's imperative that Illinois join a region. It's the only alternative. You join a region and take your chances of being named a regional site, or you don't join a region and you have to build a site for yourself." Such plans have been studied by the Thompson administration for the past several months, and could be carried out under a little-known provision of a 1963 law that allows the state to purchase or lease land on which to store radioactive waste. "We are talking about the very large problem we face in dealing with these wastes, and establishing such a site is one of our alternatives," said William O'Connor, an advisor to the governor on environmental matters. "And if we have to have a site in Illinois, we have to decide whether to close it or open it up to other states." Such a solution has been endorsed by Commonwealth Edison, if only because it makes good business sense. The utility has been involved in discussions with state officials regarding the plan. "It would cut down the cost of our transportation across seven or eight states, and we feel that Illinois has adequate conditions to provide the capacity," said George Travers, assistant to the president of Commonwealth Edison. Illinois and Commonwealth Edison will compound the national low-level waste problem this fall when the Dresden No. 1 reactor, the oldest commercial nuclear reactor in the world, is decontaminated. About 1,200 55-gallon drums of wastes will be produced in the project, the first large-scale decontamination undertaken. The process involves repeatedly flushing 85,000 gallons of solvent through the 20-year-old reactor, and is designed to remove more than a half-ton of radioactive metal oxides, known in the nuclear industry as "crud," from the inside of the reactor coolant pipes. Some environmental groups and scientists have maintained that hazards exist in burying the materials because of the use of a chelating agent in the flushing. Such agents have been found to hasten the migration of nuclear materials from trenches during research at Oak Ridge National Laboratory in Oak Ridge, Tenn. However, an environmental study released by the U.S. Nuclear Regulatory Commission in May downplayed such environmental dangers. The waste, which will become a solid, plastic-like material with the addition of other chemicals, is tentatively scheduled for burial at either Hanford, Wash., or Beatty, Nev. The utility has acknowledged that it has no firm contract for the disposal. Illinois' problem, though devoid of solutions, appears clearly defined. The state has a great deal of low-level nuclear waste and nowhere to put it. The only experience with a licensed waste site in Illinois was the Nuclear Engineering Co. facility at Sheffield, and it has resulted in a protracted headache for state officials. The company, a subsidiary of Teledyne Industries, literally abandoned the site in March of last year, citing "endless frustrating" delays in federal approval of permits to expand the dump area from 20 to 168 acres. After 12 years of operation, it left more than three million cubic feet of low-level nuclear waste buried in trenches for Illinois to worry about. Tests have showed that tritium, a radioactive element of hydrogen, has migrated from trenches into groundwater at a rate up to 25 times faster than projected by the company in the early stages of its operation. NRC officials maintain that the tritium poses no health hazards. But state officials have continued negotiations with the company, seeking long-term maintenance of the site, in part because they believe that the nuclear materials pose a threat to an adjacent hazardous waste facility still operated by the company. "Our greatest concern is that the trenches in which the materials are placed are in relatively permeable soil," said Richard W. Cosby, first assistant attorney general in Illinois. "The integrity of the trenches leaves much to be desired." Radioactive legacies exist in other parts of Illinois. An area of West Chicago about 30 miles from the Chicago Loop has been labeled "the radioactive capital of the Midwest" from operations dating back to the 1890's. Hundreds of people tested there by the Argonne National Laboratory have been found to have "radioactive breath" from the effects of thorium. Thorium and other radioactive materials have been left behind from a factory complex under different ownerships which dealt in materials from lantern mantles to ingredients for atom bomb research during the Manhattan Project at the University of Chicago in the 1940's. The complex is presently owned by the Kerr-McGee Corp. and has not operated since 1973. The primary concern in demolishing the structure is that it would create clouds of dust carrying radioactive particles. The long-term danger in storing any nuclear materials is potential migration of radioactive nuclides from the drums and cannisters in which they are stored. That possibility is heightened by the eventual decomposition of the encasements. Some nuclear officials interpret concern about the nuclear waste problem as a bias against nuclear power and an attempt to curtail nuclear development by focusing on the danger of waste. "Some of the critics are very single-minded in their pursuit," said Eugene Voiland, manager of the General Electric Morris operation. "That's okay, but let's face it head on. If we crumble our present energy system, no phoenixlike creature is going to rise up and take its place." One of those critics of current state planning is Catherine Quigg, research director for the Palatine-based Pollution and Environmental Problems. She said, "What the state of Illinois is doing is embarking on a vast, so-called temporary storage plan for both high and low-level wastes, which will no doubt become permanent because absolutely no state wants these materials. "I think that it is irresponsible for the governor and legislators to concern themselves with accommodating the needs and profits of the nuclear industry, instead of the long-term safety of the people of Illinois. " Will the feds take it over as the national dump for spent nuclear fuel? MORRIS, Illinois — The elongated baskets of spent nuclear fuel rods rise up from the bottom of containment areas like towers in an underwater city. When upended into place, they emit a cobalt blue glow until cooled by the 675,000 gallons of demineralized water in the swimming pool-like tanks. It is here, about 55 miles southwest of Chicago, where General Electric Co. operates the only such repository nationally for highly radioactive used nuclear fuel. Morris, a small town of 9,000, has become the site of a sometimes bitter controversy over plans by the U.S. Department of Energy to convert the plant to a regional — and conceivably a national and international — storehouse for spent fuel. Authorization for the federal takeover was sidetracked in Congress last spring, but federal officials say that they are continuing plans to acquire the Morris operation, either by negotiated settlement or condemnation. It has been three years since the federal government decided it should assume control of spent nuclear fuel. In July, after a general environmental impact statement was completed last summer, the U.S. Department of Energy decided to proceed with specific studies of the Morris operation and other existing radioactive waste sites at Barnwell, S.C., and West Valley, N.Y. If the feds are taking over, they need more storage capacity. It is estimated that by the early 1990's, space will be needed for some 7,000 metric tons of the spent fuel. That is likely to depend, however, on whether Carter or whoever succeeds him lifts the ban on reprocessing spent fuel. The proposed conversion of the Morris operation has been swathed in confusion. In a stormy town meeting just days before Illinois' March primary, energy undersecretary John Deutsch announced that it was "unlikely" the takeover would occur, largely because such a facility would not be located where it is not accepted by the community. His statements served to assuage some of the town's critics, while defusing the most prominent environmental issue in the crucial Illinois campaign of Sen. Edward M. Kennedy. Several weeks after the primary, in which Carter crushed the Massachusetts Democrat, Deutsch left his government job for a position at the Massachusetts Institute of Technology. Other federal officials, when asked about the status of the planning, denounced the assertions by Deutsch. "I don't know what he could have been talking about. . . . We know of no place we can go where we would be loved," said Owen Gormley, head of the department's nuclear fuel storage program. Deutsch later acknowledged that he had appeared at Morris at the request of the Carter-Mondale campaign, yet he contended that he had spoken "straightforwardly" in Morris. Although federal officials hope to eventually acquire more than one facility, the Morris operation is viewed as the site which could be converted the most rapidly and at the least expense — about $30 million. "We are close to agreement with them [General Electric]. There seems to be a better possibility of reaching an agreeable figure" than the other sites, Gormley said. The South Carolina facility at Barnwell, owned by Allied General Fuel Services, would cost more than $200 million to acquire. It has the potential, however, of nearly twice the storage capacity of Morris. The Nuclear Fuel Services Co. plant in New York at West Valley has experienced pronounced difficulty in cleaning up radioactive material since reprocessing was halted there in 1972, leaving behind some 600,000 gallons and two million cubic feet of material buried on the plant site. "It is a very hot place," one official said, in a reference not directed to its prospect of being chosen. No estimate has been made of the purchase cost for the plant. Morris presently stores about 325 metric tons ot the spent fuel, which will increase by year's end to about 350 tons under a contract with the General Electric San Onofre nuclear plant near San Clemente, Calif. General Electric officials have acknowledged that the site could store about 2,000 tons with reracking and additional construction. People nearby the site have generally accepted living in the shadow of the heaviest concentration of nuclear facilities anywhere. And although the General Electric plant is generally considered well-run and relatively safe, many are wary of the storage expansion plan. One of those is Karen Hynds, a co-founder of a group called Citizens Against Federal Takeover. "Many of what you might call typical people in this community have decided we don't want to be the international dumping ground for this stuff," she said. Company officials maintain that the gridwork which holds the fuel baskets in place was built to withstand an earthquake of 6 on the Richter scale, and that even a substantial tornado could not remove enough of the water to leave the rods dry and lead to radioactive releases. A company official has acknowledged the "inconceivable" — that an extreme amount of explosives could fracture the walls allowing a drawdown of water that could lead to a situation in which "radioactive beams would shoot upward like rays of light. We could have a problem. But something like that is inconceivable," he added.